Jeri says... A Solvang Road Less Taken…. The Solvang Half Century ride didn't exactly go as planned. We departed early in hopes of beating the forecasted rain (which according to the map, was moving southwest, away from us). We met up with Dave Rideau and his wife Amy at SAG1 (support and gear) in Lompoc. Dave has done this ride before and suggested we cut out the “block through town” because it has a lot of lights, and advised that we continue on the loop back via route 246 (which you can see on the original route map below). It shaves off about 4-5 miles, so if you want to be exact, mileage-wise, the Lompoc block will get you there. It also adds about 30-45 mins to the ride, which is no big deal. Being newbies, we wanted to do the whole thing and agreed to meet Dave and Amy for lunch after they arrived at the finish line. We decided to do the Lompoc block, and this is where everything went completely wrong for us! First, there were only a handful of riders on the Lompoc block, which began and ended at SAG1. By the time we made our way around “the block” (30-40 mins) and back to SAG1, it began to pour. Not only were there no riders in sight once we got back, SAG1 was already torn down. So we continued down the original route 246, in the pouring rain. The only rain jackets we had were black (remember the rain test?) and there was no berm on the road, with cars going 75 mph around us. We had lost our pack of riders and I thought we might get run over. We made it about ¾ of a mile down 246 and decided to turn around and go BACK to Solvang the way we came in, via Santa Rosa Road, as you can see in the second map here. Santa Rosa has a lot of elevation terrain and is windy but there's certainly a lot less traffic. It's the toughest part of the trip, which is why it's nice to get it over with on the front end. Little did we know we'd be alone. Not ONE SOUL was going back that way and no “support vans” were in sight. We were in torrential downpours with strong headwinds and completely isolated the entire ride back to Solvang (about 26 miles). When we weren't killing ourselves climbing those hills for the SECOND time, during our downhill momentum we were getting stung and pelted in the face with rain from two directions—the sideways, windblown rain, and the added bonus of the road water/mud combo thrown up from the front tires. Kind of like those multiple shower-heads, but a lot less inviting. Rideau thought we were MIA because cell service was spotty. We had no choice but to power on. We had to cross that finish line! And, we did. But, at least we were able to laugh at the absurdity of it all, and enjoy the beautiful scenery a second time—this time with some added bonuses: almost 57 miles and 2,700 ft elevation gain. Plus some bonding with a few creatures along the way. 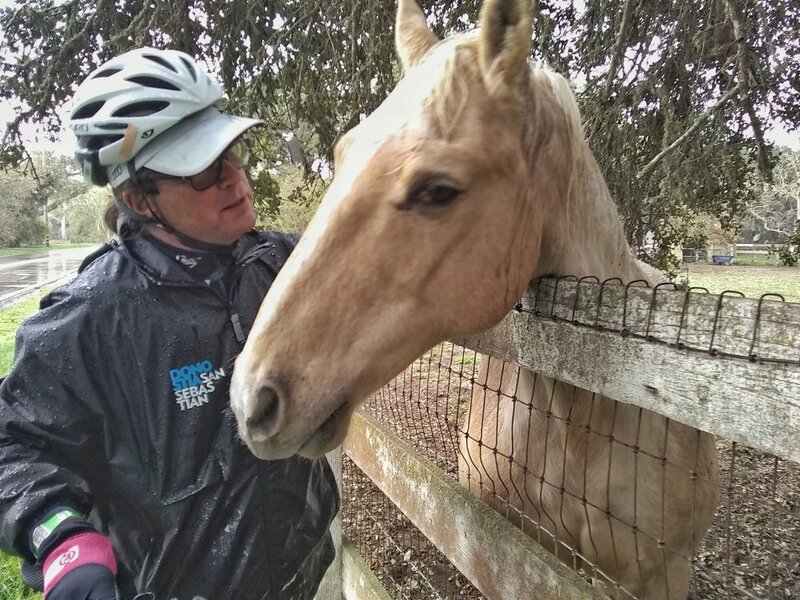 Jeri says... We Survived Fires and Flu; a Little Rain Can't Stop our Solvang Ride!